A simple card for simple times. The times where you want to step forward and stick a knife into a someone’s guts that is. Step is a keyword. For those that don’t play a lot of card games, that means it has a bunch of special rules associated with it. In this case, we don’t write all those rules out because we use the word a lot and expect you to remember what it means. What it does mean is that when you play a Step card, you can immediately, before you actually attack, move your character the number of squares written after this Step keyword. In this case, it’s just one square, but that one square can often mean the difference between being able to attack and not. Or it can mean the difference between leaving yourself next to that Ogre or getting out of its reach. Step cards are really useful because they are multi-functional. Sure, in some sense they are just longer range attack cards, but they can also be used for other purposes. Like: getting behind an enemy to evade their defenses, stepping away from an enemy you don’t want to be next to, getting into line of sight of a target, moving off terrain that you don’t want to be on, positioning yourself so that your wizard’s fireball won’t include you in the blast radius and on and on and on. It may be a Simple Thrust, but it has a multitude of uses. Everyone is going to want some Step cards in their game. Now it’s starting to feel like your just taunting us by telling us so much about the game. WHEN WILL IT BE DONE??? 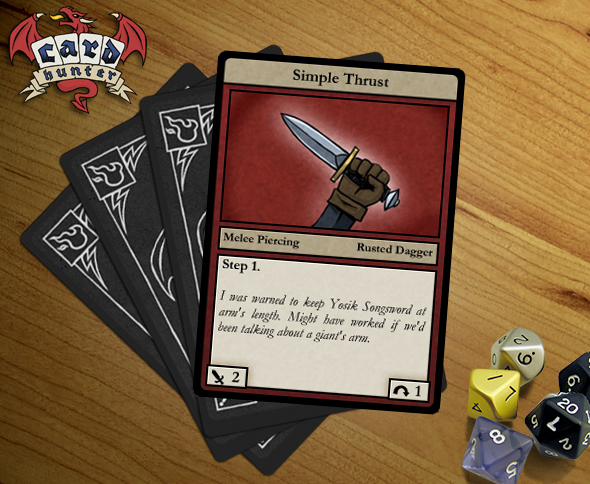 Sounds like a simple, but totally useful card you’ll need. Keep ’em coming! Is it possible to use this card JUST to move? Or is there an constraint like, “If you want to use this card to move, fine, but you have to stab someone when you’re done moving” ? @thebangzats: you can use the card just to move, but then you have to choose a target if there is a legal one (in range). So you need to be careful about moving to a spot where you can only stab friendlies. That leads to an interesting question. Are actions generally targetable on friendlies? Are there “opposing” or “friendly” only actions? I personally like the freedom of choice, as they often allow interesting actions, but these can also be difficult to anticipate and balance. @Derek: yes, cards can generally target anyone regardless of team and sometimes there are reasons to do so.